For quite a long time, the P90X workout program has been considered as one of the best choices available on the market. This workout program is based on the muscle confusion technique to continuously train the muscles. This workout program is suitable for dedicated people who really want to shape their bodies, and it can also deliver significant weight loss effects. However, there is now TRX Training, which aims to compete against P90X to be the best workout program. TRX Training offers various heavy exercises that use your own body weight for resistance. Let’s see the comparisons between TRX Training vs P90X below! Compared to many other workout programs available on the market, P90X is indeed quite expensive. While some other programs only cost $30 – $50, P90X may cost you $115 – $160. This is because you also need to equip yourself with some dumbbells and pulleys in order to get the fullest benefit from the workout program. Still, many people think that the benefits outweigh the cost. On the other hand, TRX Training is even more expensive. It may cost you $160 – $180. However, the package already includes both the workout program and the equipment that you need to get started and reap the full benefits. This is because many exercises here take advantage of your body weight as resistance. So, it does not really need many additional tools. Take a look : TapouT XT vs P90X. 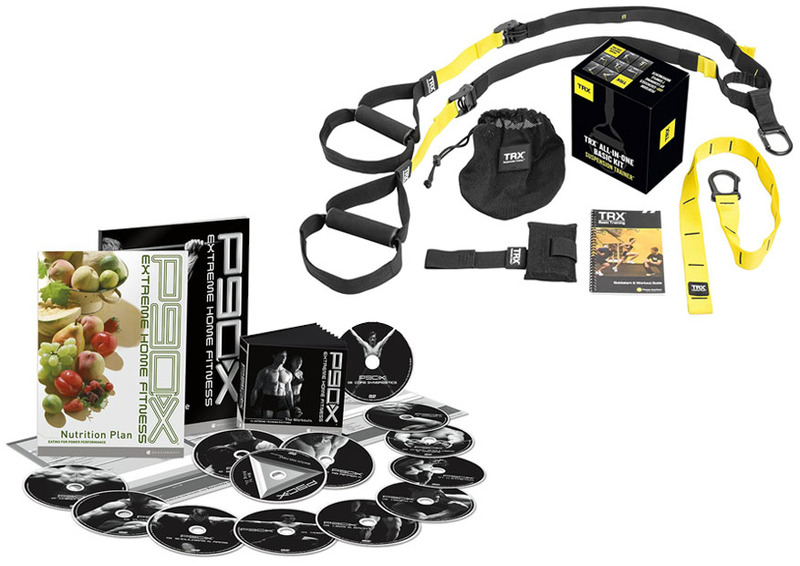 A bundle of P90X workout program includes not only the DVDs but also a nutritional guide, a personal workout calendar, and a personal trainer. The nutritional guide controls what you have to eat every day, but there are great recipes here that taste great. The personal workout calendar is handy to help you keep track of your progress. The personal trainer will communicate with you via email to motive you and to make sure that you get the most out of the exercises. On the other hand, TRX Training only comes with the DVDs that teach you about all of the exercises available along with the nylon straps that you can use to perform the various exercises. These nylon straps are very durable. P90X is highly effective due to the muscle confusion technique. The workouts change every day so that your body will keep guessing and the muscles will constantly try to keep up. There are three phases, and each phase goes for about 4 weeks. In the first three weeks, you will be pushed to your limit every day. The fourth week is a recovery week where your body is put on stretching and yoga. Note that P90X is not suitable for all people. It is extremely heavy and intense. There is a fit test in the booklet that is given before you purchase the product. If you can’t pass the exercises of the fit test, this workout program is not suitable for you. On the other hand, TRX Training was created by a former Navy Seal, and its economical exercises are based on Navy Seal’s training. There are more than 300 workouts available. It is quite easy to perform because you can train your whole body within just 30 minutes. If you want to choose the most powerful workout program, P90X is still the way to go. It is highly effective for losing weight and developing muscles. However, if it is too demanding for your body and you can’t pass the fit test, TRX Training can be the alternative. There are various exercises that you can choose to suit your particular condition.